Pope Benedict XVI has met with Cardinal Camillo Ruini to discuss the investigation of Medjugorje, a veteran Vatican reporter informs. Cardinal Ruini’s commission still has six or seven months of work left, and while the visionaries have made a good impression in Rome, most Vatican observers do not expect the Commission to be openly for or against. 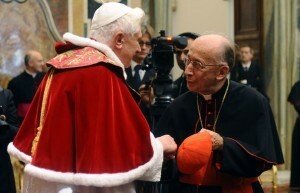 Pope Benedict XVI receives Christmas greetings from Cardinal Camillo Ruini. By next Christmas, the Vatican Commission’s report on Medjugorje should be finished, Cardinal Ruini told the Pope who had called him to give a briefing on the issue on February 24. The Vatican Commission on Medjugorje has six or seven months of work left. By the end of this year the commission headed by Cardinal Camillo Ruini will conclude its work with a pronouncement to the Congregation for the Doctrine of the Faith and then Pope Benedict XVI. Early on February 24 this schedule was presented by Cardinal Ruini when the Pope received him in audience to discuss the progress of the investigation, the experienced Vatican journalist Andrea Tornielli informs in Vatican Insider. Like other sources before him, Tornielli likewise states that visionaries Ivan Dragicevic and Jakov Colo met with the Commission earlier this week, and that all six visionaries have now appeared before the Commission. “Currently, it is not possible to predict what the final verdict will be. The seers have generally made a good impression on the Commission members. But the outcome considered most likely in the sacred buildings at the moment is a repeat of the 1991 suspension of judgment, without openly taking a stand for or against” Vatican Insider reports. In 1991, the Yugoslav bishops left the issue of Medjugorje’s authenticity undecided, leaving the matter open for more investigations. Since then, the bishops’ verdict “non constat de supernaturalitate” was often misinterpreted to mean that the bishops had condemned Medjugorje while in fact the bishops refrained from raising their voices on the issue. Vatican Insider further tells that the visionaries’ audiences with the Commission have taken place in a hall of the Vatican Congregation for the Doctrine of the Faith where the Commission has its archives.